Yodo Kono, a Zen priest with 10 years of Zen meditation experience warmly welcomes you to this retreat to experience Zen and Japanese culture at a Zen temple in Japan. The highlight of this retreat is the Zen temple, which has a history of approximately 670 years. Your accommodation and food will be provided in a guest house that takes 30 seconds on foot from Zen Temple. Hiji Town where this retreat located is a scenic place with mountains in the north and the sea in the south. In addition, there are many places to visit that are castle towns. Beppu City, the most famous hot spring resort in Japan is just a 10-minute train ride from the nearest station. You can go to the hot spring at free time or visit JIGOKU (a sightseeing spot). Experience Japan to the fullest and enhance your Zen practice! The accommodation is a 30-second walk from Zen Temple. There, guests eat and stay with the Master. For the retreat, it takes place at the Zen temple with a history of about 670 years. This is a really valuable experience. There are not many places where you can experience a Zen temple in Japan. Yodo Kono is a Zen priest. He is a former high school physics teacher and master of Physics. When he was 29 years old, he went to practice Zen. Zen’s experience is ten years. He meditates every day. This retreat takes place in a very nice place of scenery. Hiji Town is a castle town with a mountain in the north and a sea in the south. In addition, the next town is Beppu city which is the town of the most famous hot spring in Japan. Meals are dishes that Japanese people eat at home. The guests have an experience of making meals with the Master. From the airport, you can train from Hakata Station (Fukuoka city) to Kitsuki station (Oita prefecture) (about 1 hour 30 minutes). Please change to a regular train at Kitsuki station (Oita prefecture) to Bungo Toyooka station (about 30 minutes). It is a 15-minute walk from Bungo Toyooka station to the guest house. If you let the organizer the arrival time to Bungo Toyooka station, they will pick you up by car. Also, even if you call the organizer from Bungo Toyooka station, they will pick you up by car. You come by bus from Oita airport to HIJI town (about 27 minutes). However, get off at “HIJI” stop. Walk from “HIJI” stop to Yokoku station (about 5 minutes). There is a taxi at Yokoku station, so if you are tired, please take a taxi to the guest house (about 10 minutes). If you tell the organizer the arrival time to Yokoku station, they will pick you up by car. From Yokoku station, it takes one hour to the guest house so please do not walk. Or else, from Yokoku train station, you can take another train to Bungo Toyooka (about 3 minutes). It is a 15-minute walk from Bungo Toyooka station to the guest house. It is a 15-minute walk from Bungo Toyooka station to the guest house. If you let the organizer the arrival time to Bungo Toyooka station, they will pick you up by car. Also, even if you call the organizer from Bungo Toyooka station, they will pick you up by car. From Kyoto Station (Hiroshima Station) to Kokura Station (Kitakyushu City, Fukuoka Prefecture), come by the bullet train. From there, take a train from Kokura Station (Kitakyushu City, Fukuoka Prefecture) to Kitsuki station (Oita prefecture) (about 1 hour). Please change to a regular train at Kitsuki station (Oita prefecture) to Bungo Toyooka station (about 30 minutes). It is a 15-minute walk from Bungo Toyooka station to the guest house. If you let the organizer the arrival time to Bungo Toyooka station, they will pick you up by car. Also, even if you call the organizer from Bungo Toyooka station, they will pick you up by car. 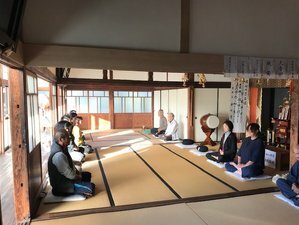 If you are interested in real Japanese culture, let ‘s experience Zen Meditation and Japanese culture in a Zen Meditation Retreat set a temple of 670 years old.